The one and only time I've been to Fatburger was three years ago when I shared the XXXL triple king burger with friends. Recently a coworker suggested a quick lunch at Fatburger, so I tried the 1/4 pound baby fatburger ($4.49) with cheese (+$0.79), and fries with a side of gravy ($3.79). I was surprised at the size of the baby burger; it wasn't as small as I had expected. The beef patty was juicy and the toppings of lettuce, tomato, onion, and pickles were fresh and crunchy. The golden fries were served piping hot and crispy on the outside. The gravy was a bit weak in flavour, but the fries were enjoyable enough without it. Although I'm not very much into burgers, I do think that Fatburger is one of the best burger chains in town. 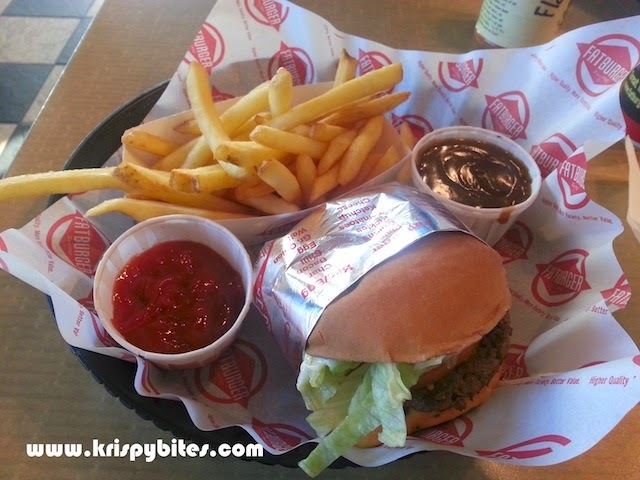 Compared to Five Guys Burgers, the Fatburger patty is much juicier. And although Five Guys offers complimentary peanuts, I prefer a cleaner floor without peanut shells. Five Guys also has boardwalk style fries which are firm but not crispy, and much less appealing to me than the crispy golden ones from Fatburger. Some complain about the steep prices, but that isn't much of a problem for me since I don't usually get extra toppings or add-ons.